If anybody believed the President's excuse of November 6th and again in his November 7th press conference that, in order to protect the unemployed and the American economy, he had no choice but to surrender to the Wealth Party and agree to borrow and give to the already too rich over 400 billion from China and a trillion and a half more from any other sovereign piggybank willing to lend, I"ve got some AAA-rated mortgage-backed securities to sell them that Fannie and Freddie can't give away. By now, most progressives who still proselytize Obama's victimhood under 24/7 assault from the Wealth Party can only be viewed with pity or contempt by the rest of us who stopped drinking Obama's weak tea long ago. True, the Party of Wealth maliciously took every unemployed American hostage, but that's what these thugs do, and they do it fearlessly. Barack Obama always raises the white flag of surrender to avoid battle. He is nothing like his hero Abraham Lincoln looking for a general who will fight. He is General McClellan, lazing on the Potomac while his country is on the verge of perishing. Obama, as he always has, got exactly what he wanted, but hid like a coward behind the unemployed as cover for his duplicity. 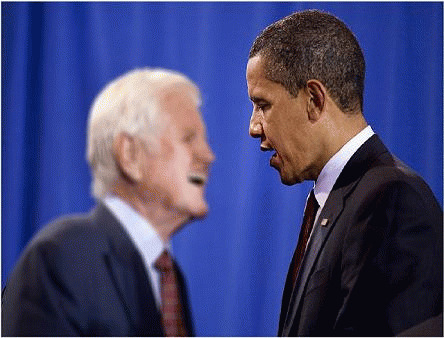 As I listened to the President's surrender announcement to the army of the billionaires, I thought of Ted Kennedy--that great champion of the middleclass and the working poor--who had rescued single-handedly Obama's floundering presidential candidacy after the candidate promised to help Kennedy realize his decades-old dream of universal healthcare. I wondered if Kennedy, in his last weeks of life, saw Obama was about to double-cross him and enrich the barons of the healthcare industrial complex even more by spitting on a public option and requiring already financially-strapped workers to give the few quarters left in their pockets to those insatiable racketeers. And I wondered if the ghost of Ted Kennedy was present near the podium when his designated heir to the Kennedy legacy again chose to side with the richest people in the world over the millions who have lost their jobs, their homes and even their lives to the bottomless greed of a few billionaires and their plundering hoards. "When does the greed stop?" I could almost hear Kennedy's scornful voice shout at the President, both arms stretched out and frantically waving. "When will you stop it, Barack? What next will you do for the richest 2 percent? Flush Social Security down the presidential toilet?" Yes, Senator. Yes he will. Does Obama ever think about the great white-haired old senator who believed, like millions of others, so much in him: his charm, his rectitude, his integrity and his compassion and his promises of "real change you can believe in'? Is he ever haunted by memories of the great man who traded his reputation so that Barack could have a better one? Or does the ghost of Ted Kennedy rage helplessly in his afterlife at a smooth con artist who suckered him into devoting the last year of his life in a passionate campaign for Oprah's "The One'? Perhaps the ghost of the old senator may visit Obama's sleep this Christmas to tell President Betrayal, "I visit often in the afterlife with Lincoln. Lincoln is my friend. You, Barack, are no Abraham Lincoln. You're just as phony as your healthcare bill."